Little is known about his life, but from his writings it is clear he was a zealous pastor. .
Born probably at Smyrna (Turkey) about 130; died at Lyons (France) about 200. A pupil of Saint Polycarp (23 February) who became a presbyter and bishop of Lyons, the principal city of Gaul. Intervened in Rome for patience and reconciliation in Church disputes. Among the first theologians of the Western Church, he refuted gnosticism and further developed the theology of the incarnation. Noted for his fidelity to apostolic tradition. 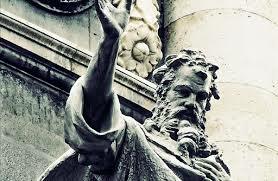 Irenaeus was with the group that first brought Christianity to Lyons, France, where he became its second bishop. Known mainly from his writings Against Heresies and The Presentation of the Apostolic Preaching that explain and defend the apostolic tradition, he also pleaded with the Pope for patience with heretics and schismatics in the interests of Church unity. Patrick Duffy tells his story. Irenaeus (means “peaceful” in Greek) was probably born in Smyrna (now Izmir in Turkey) where he attended the school of Bishop Polycarp, who in turn had been a disciple of the Apostle John. Irenaeus’s move from Asia Minor to Gaul coincided with the beginnings of the Christian community at Lugdunum (Lyons), where in 177 he is listed in the college of presbyters. In that year he was sent to Rome with a letter from the community in Lyons to Pope Eleutherius. This mission to Rome actually saved him from the persecution of Marcus Aurelius, during which the 90-year old Bishop Pothinus died from ill-treatment in prison. Irenaeus succeeded him as bishop and spent the next twenty years building up the Church in the Rhône valley and surrounding areas. Little is known about his life, but from his writings Against heresies and The Presentation of the Apostolic Preaching it is clear he was a zealous pastor. They have a twofold aim: to explain the truth of the faith clearly and to defend the true doctrine from the attacks of heretics. What Irenaeus confronted was the so-called Gnosis, a theory which held that the faith taught by the Church was merely a symbolism for the simple, who were unable to grasp difficult concepts; but behind the faith proclaimed, the initiates, that is, the intellectuals or Gnostics, could discover an elitist knowledge. One element of this elitism was “dualism”: besides the positive or good principle which was identified with God, they said there was the negative or evil principle, which produced material things, matter. 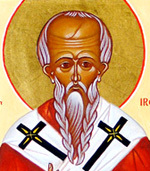 Besides his writings Irenaeus is known to have pleaded to two different popes for patience with heretics. This shows a broad and sympathetic personality along with a great desire for unity in the Church. The first pleading was with Pope Eleutherius when he brought a letter urging leniency towards the Montanist enthusiasts of Asia Minor with whom personally he probably didn’t have much sympathy. 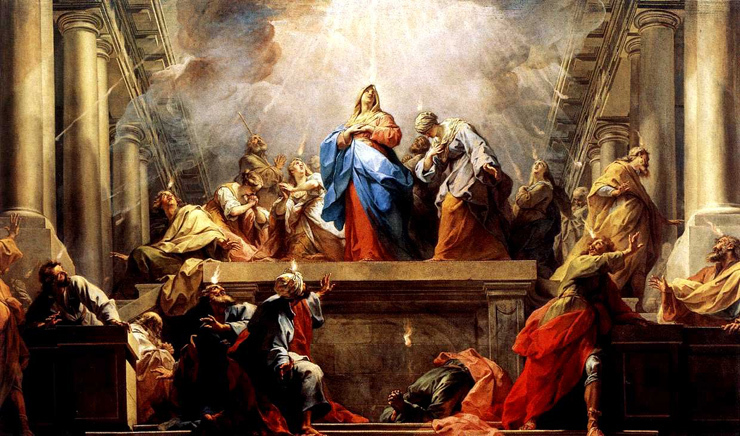 The second was in 190 when he urged Pope Victor to be patient with the Quartodecimans of Asia Minor whom he had excommunicated for celebrating Easter on the day of the Jewish Passover instead on the following Sunday with all other Christians. Irenaeus died at the start of the third century AD and his body was buried at Lyons in the Church of St John (later, the Church of St Irenaeus), but the shrine was destroyed by Calvinists in 1562. Although he is venerated as a martyr, the evidence supporting this is not decisive.